Easter crochet crafts are fun to make. It's delightful to work with the colorful pastel and bright hues of the season. The animals symbolic of the season are all so cute. Plus there are so many different things that you can make. You can craft gifts for Easter baskets and even crochet the baskets themselves. You can make Easter crochet accessories for the whole family. 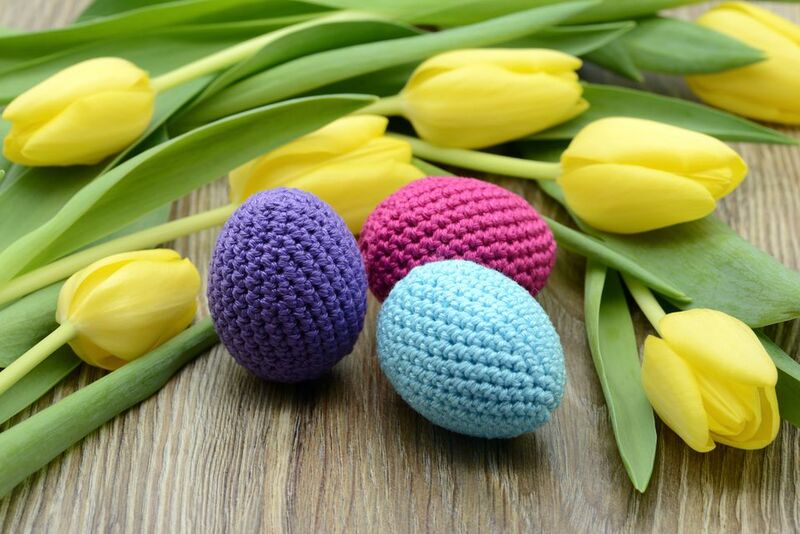 You can also crochet Easter projects for the home. 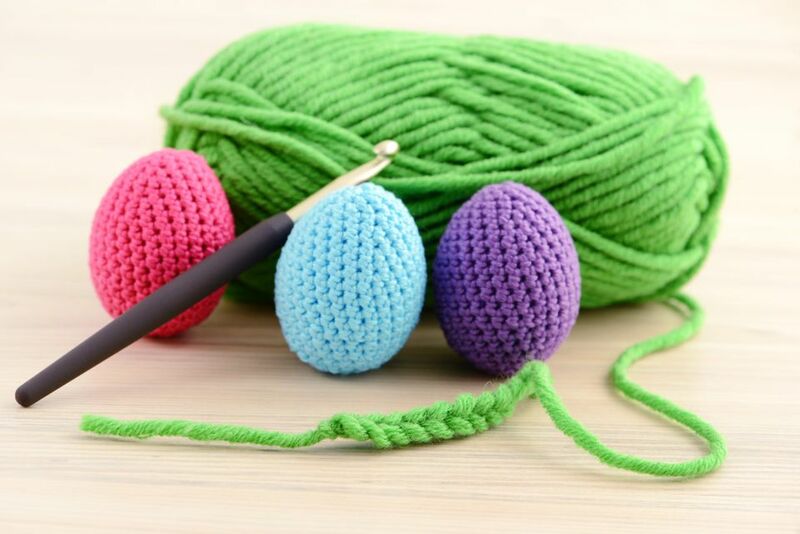 Have fun making everything you need for Easter with these 22 crochet patterns. Any child would be thrilled to play with this lovable, huggable crochet Easter bunny. Those soft, cozy feet and oversized ears bring out the essence of all that is cute about this holiday animal. Gift it for Easter and the child will enjoy it all year long. This is a cute contemporary take on a classic Easter bunny ... and it is made in a mini-size. This is perfect for including in this year's Easter baskets! You actually get two patterns in one here: the mini-bunny and also the boy-as-bunny variation. This crochet pattern comes in sizes newborn through adult. If a big group of you are all going to a big Easter event and want to find each other easily in the crowd, then matching lamb hats are a perfect choice. Gift one to everyone that you know to bring smiles to faces during Easter season. Have you ever found yourself sniffing around the house weeks after Christmas trying to locate the funky odor of an egg that was never found in the Easter egg hunt? Avoid that problem and many other real-egg annoyances by replacing regular eggs with crochet Easter eggs. These amigurumi eggs are a simple free pattern that you can decorate in many different ways including the recommended embroidery flowers shown by the designer. Keep all of your eggs safe (not to mention super cute!) when you wrap them up in egg cozies. This free crochet pattern is a beautiful design with a classic feeling, great for decorating at any Easter party. Looking for something a bit more kid-inspired or colorful? Check out more Easter egg crochet cozies. There are lots of different ways to cover Easter eggs in crochet for a cozy twist on a classic craft. Want to create a cozy egg covering that still allows the pretty egg itself to show through? This thread crochet design is a great choice. It is inspired by the popular crochet-covered stones that many people have created but offers a more delicate alternative. Get your baby all dressed up for Easter in this diaper cover with matching sun hat. This one is perfect for Easter photos as well as any activities that baby will be attending this year. Everyone who sees this baby will smile with the spirit of the season. Would you prefer to dress baby in a beautiful Easter dress for church and other gatherings? This crochet dress pattern is designed for babies age 3-6 months. It is a perfect choice for a pretty Easter outfit. Of course, you could make this dress for newborns to wear all through spring and summer. Crochet a bunch of colorful Easter chicks to decorate your desk at work, your table at home, and still fill every child's Easter basket. These colorful birds will make people of any age smile. You might also want to check out our roundup of 10 Easter chick crochet patterns. Check there for a variety of different types of Easter chicks including a classic yellow one and another that looks like a marshmallow Peeps chick. This crochet pattern combines an adorable floppy-eared easter bunny with an egg cup that can hold a cute Easter egg. You could also put tea bags or other small items in the egg cup instead if you wanted to use this bunny as an Easter gift. This detailed doily has precious bunnies playing peek-a-boo, poking up from colored Easter baskets that circle all the way around the design. There are also some colored Easter eggs decorating the center of this doily, which is uniquely shaped in a nontraditional, non-circular format that gives it a contemporary flair. It will look great on any Easter table. This is one of the most unique crochet Easter baskets you're ever going to see. It includes a small traditional basket in the center. Around it is a type of egg cozy that will hold half a dozen eggs on the outer side of the basket. It's a great idea and it is also fun to crochet! This free Easter crochet pattern is intended as a play set for children. The Easter bunny is the main item but it includes instructions to make small Easter eggs and a spring flower, too. These work well to accompany candy in an Easter basket. Get the best Easter pictures ever when you dress your little one up in this precious bunny hat. And don't stop with your little one; this pattern comes sized for all ages so you can get the whole family in a bunny hat photo! Be sure to also check out the full roundup of bunny hat crochet patterns for additional design ideas. Bunnies definitely make cute Easter hats but they aren't the only option for an Easter crochet animal hat. Try baby chick crochet hats, too. This one is a very simple design created for children. The beanie is easy to make and the chick emerges when you add eyes, a beak, and some hair feathers. Let your little one be the most unique child at the party with a handmade, personalized crochet Easter basket. This can be used for collecting eggs. Of course, it can also be used for giving Easter gifts. This free Easter crochet pattern is built around a plastic canvas base. Explore other free crochet Easter basket patterns here. Use this free crochet tutorial to learn how to make a granny circle or mandala. Choose pastels or bright springtime colors for each round to create a mandala that is perfect for Easter. Use your Easter mandala as a placemat, doily, wall art decoration, or even as a small rug. Have you ever made a crochet candle before? Easter is a great time to start using this design that incorporates springtime flowers along with iconic religious symbols. The felted flame atop the candle is a great crafty touch. This snuggly, also known as a lovey, combines a stuffed animal with a blanket. Young children love these! The Easter bunny amigurumi doll at the center is perfect for Easter. The colors of the granny square blanket are bright and lovely, ideal for the springtime season. Want to make a lovey blanket that features a chicken rather than a bunny? This one is a cute choice. The little chick in the center is nice and plush while the blanket is brightly sprinkled with crochet flowers. Here is one more lovey blanket crochet pattern to complete your Easter collection. This one is the adorable lamb blanket. It doubles as a terrific baby blanket gift all year long since the lamb is not just an Easter symbol but suitable for any nursery. The reason that Easter eggs are so mesmerizing is because of their terrific bright colors. That's something that we always love in a great crochet afghan, too, so it makes perfect sense to design an afghan inspired by Easter eggs. This one is a great choice. And the oval-in-a-square design is abstract enough that it doesn't have to look like Easter eggs; make different color choices and this blanket could easily be useful in your home throughout the year.